Updated for WindowBlinds 6 and Vista! This Star Wars inspired skin is a little different for me. I was trying to capture that grungy, battle damaged look of the Old Republic fleet. 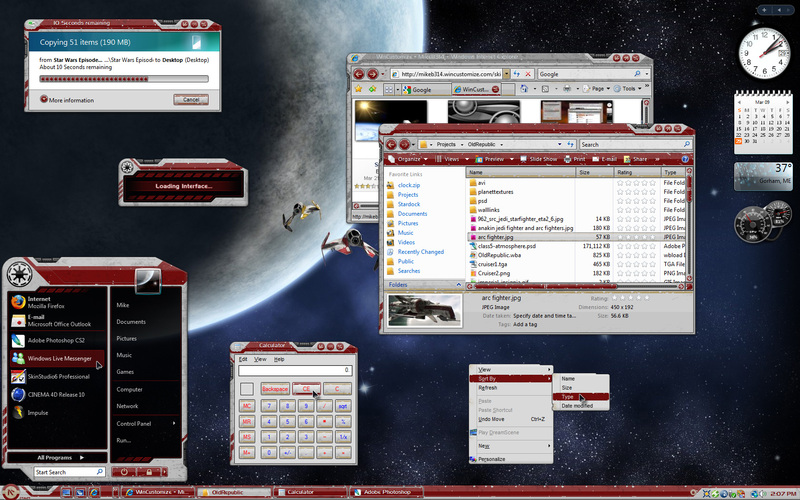 It includes the usual toolbar icons, shell animations, and all the WB5 goodies. Well done Mike. but we already knew that. I love Star Wars... I love this Windowblind... I love MikeB314. great work! ...but, it works for WB 4.6? reminds me of G-pod otherwise very nice. Awesome job, as always! Excellent quality wb! Love the look and feel of this one! Many thanks for sharing! Amazing skin! I look forward to seeing what you will create next, knowing that it will be more than a 5 star window blind. And very nice wall too! This is the best, Mike! Great work Mike. The textures are excellent! Its about freakin time we got a new skin from you! I was startin to worry you wouldn't do another skin! A great job...as always!